If Only They Were All Butterflies. But No, They’re Flies. A plague of flies! Right after Typhoon Glenda, we noticed a LOT of flies at the farm. We would be eating in the kitchen and there would be 10 flies on the window screen trying to get inside. Eww. When there was no food prep going on in the kitchen, the flies congregated on the veranda. Their favorite spots were the wood table and tile floor. I have no idea what attracts them to those two areas. Is it because the tiles are yellow and flies like the color? Does the table have a certain smell? The worst thing about flies though is that they like to land on people! That just elevates their yuck-level to from “eww” to “how can I kill all of you?”. 1. Feeding the horses diatomaceous earth – It is passed out by the horse and is supposed to kill the larvae that hatch on the horse poop. It didn’t seem to have an effect on the fly population, so I stopped feeding it to the horses. 2. Fly traps with attractant – This is commercial product, it’s a plastic bag that you fill with water, pour in the attractant, then hang outdoors far from your house. They did get filled up with a lot of flies. I decided not to buy more of them because I didn’t know how to properly dispose of the plastic bag full of flies. They recommend burying it, but that just seemed wrong. 3. Fly traps with bait – I tried the homemade versions from the internet and the Rid-Max Fly Trap. Both the homemade and commercial traps caught very few flies. The flies would get attracted to the bait, but they wouldn’t enter the trap. Very frustrating. The Rid-Max also had the problem of getting knocked down by the wind. 4. Fly paper – Plain fly paper caught more flies than the traps. We also turbo-boosted the fly paper by adding bait. The best bait this season has been mangosteen, followed by Franco’s sweaty clothes. Downside is it’s messy to deal with. I have to tape it down so the wind doesn’t blow it around. 5. Fly Swatter – This is effective and quick. We have become deadly accurate. But, it’s time-consuming and messy. 6. Citronella and Mineral Oil Spray for the horses – This was recommended by the vet and works well. I mix 10% citronella oil (not the one for lamps!) with mineral oil. It didn’t seem to be working as well this season. Turns out caretaker #2 was applying it wrong. He was spraying it directly into their wounds and fly bites! Now that he’s applying it properly, their wounds are healing well and they are less bothered by the flies. What to do now? I decided to turn to the internet for help. There are a lot of natural fly repellant recipes and remedies online. I collected the ones that seemed plausible or popular and planned to test them out myself. I was excited to conduct my fly experiments. But then, the next time I went to the farm, there were much less flies. The plague had passed, without my doing anything. Nature has its own ways. I don’t know what made the fly population die down so dramatically. Maybe it was because we mopped the floor. Maybe all those White-breasted Woodswallows ate the flies. Maybe all those dragonflies ate the flies. We’re seeing a bigger variety of creatures around — crickets, praying mantis, spiders, frogs, lizards. Maybe all those creatures ate the flies. Masanobu Fukuoka says in The Natural Way of Farming The Theory and Practice of Green Philosophy that “One never blames nature, but begins by blaming oneself .. Thus, in natural farming, one always solves the problem by reflecting on the mistake and returning as close to nature as possible.” The flies were congregating on our man-made structures, but not on the trees or the the fields. 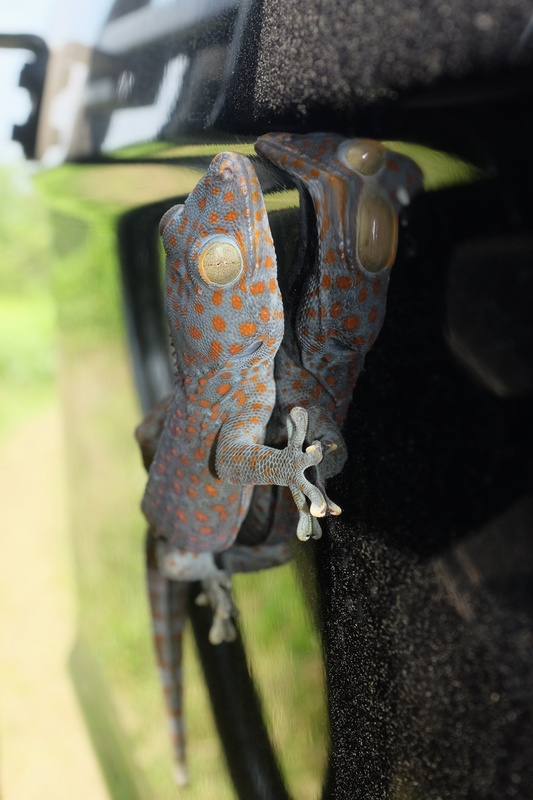 Tuko Gekko gecko In English, this is Tokay Gecko! 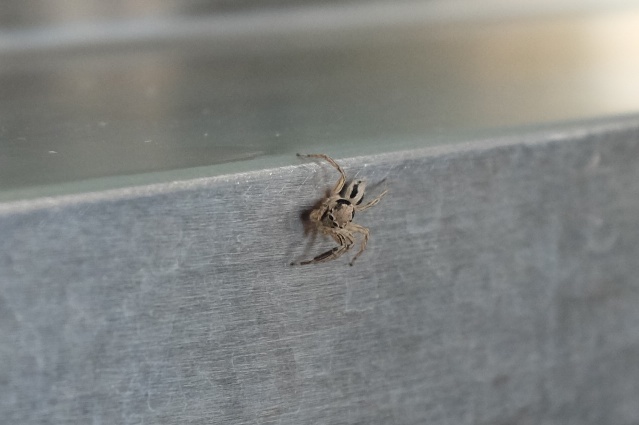 Can you see the skull on the tiny spider? 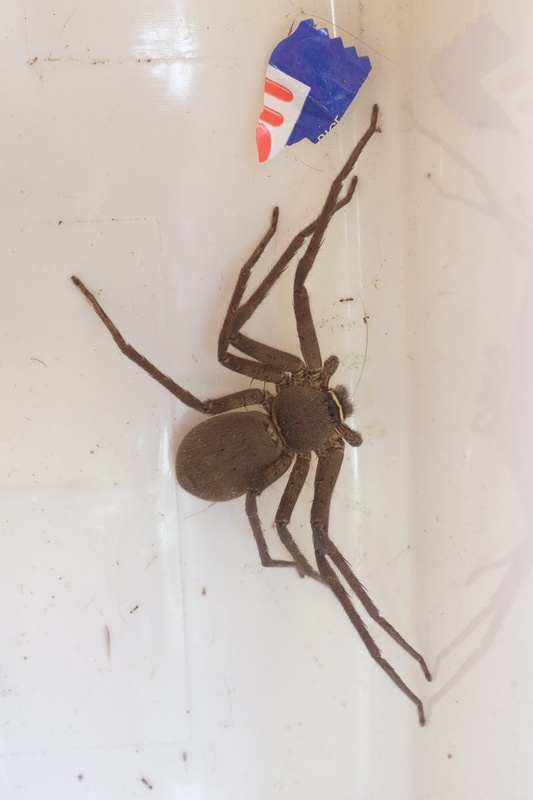 I think this is a Huntsman. 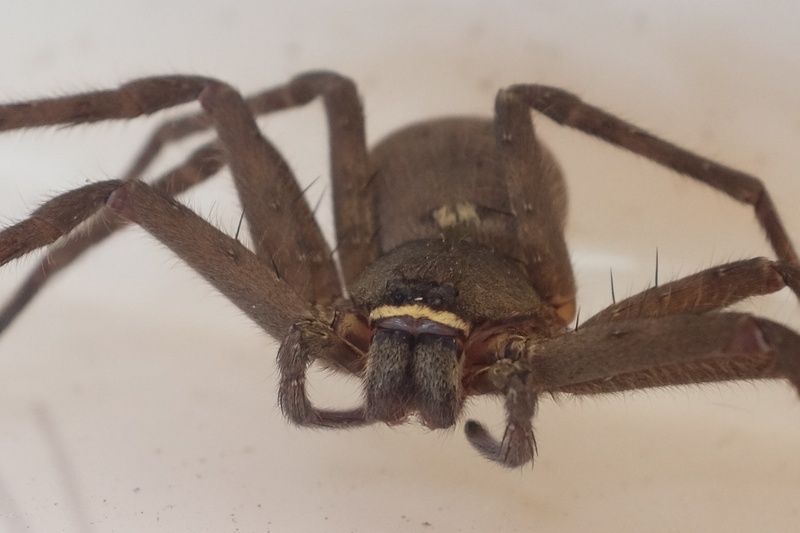 They are scary looking, but supposed to be harmless. They can bite, but the swelling and pain passes within a day or two. natural fly repellant and killer? 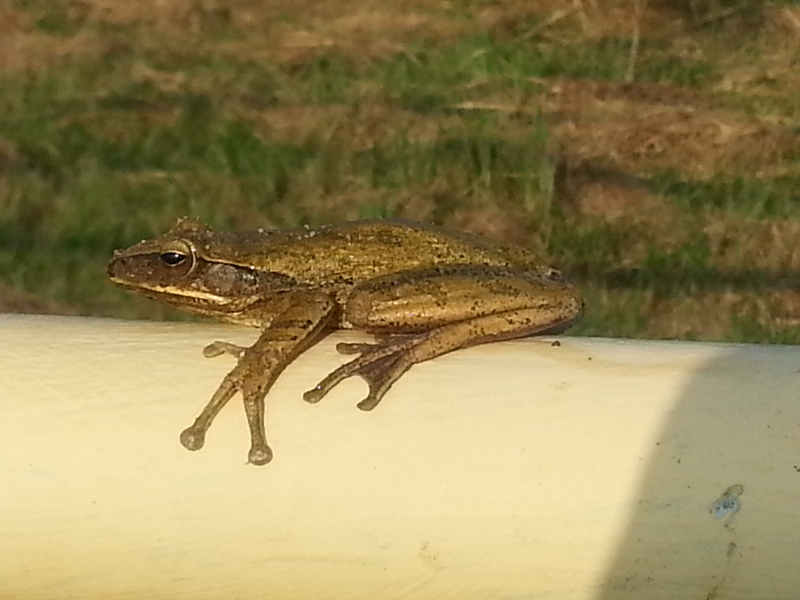 Thanks Tonji for the great pics of the tuko and tree frog! 1. 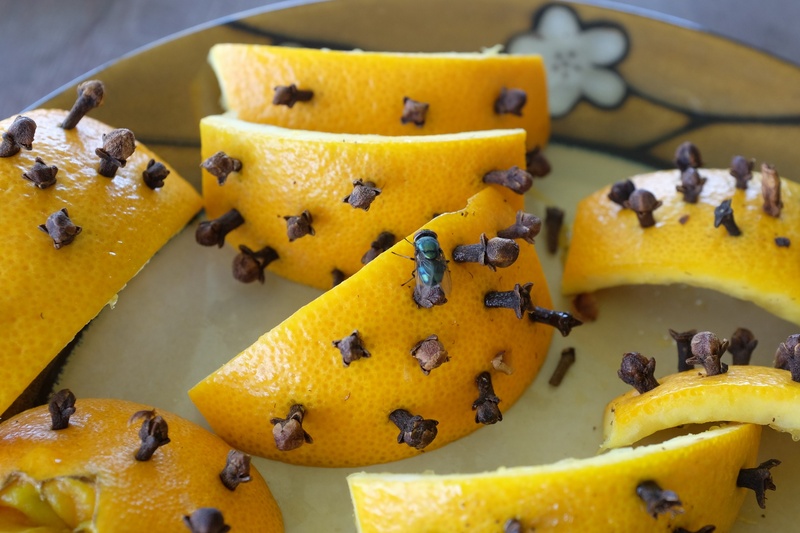 Orange with cloves – Flies are supposed to be repelled by the scent. Franco thinks this is what they used in the Medieval times to ward off the plague. Tonji thought it didn’t work. I thought it did, but that it was a waste of an orange! I tried using orange peels stuck with cloves, but that attracted the flies. 2. Plastic bag with water and pennies – I used actual US pennies for this! This is supposed to be an optical repellant. Some people swear by it! A lot of people say it doesn’t work. It didn’t work. 3. Tea Tree Spray – I tried 1 tsp tea tree essential oil + 1 Cup water. This was recommended as a fly repellant to be sprayed on horses and on yourself. It didn’t work. The citronella works better for the horses. I was happy to discover that tea tree essential oil is great for insect bites! You can apply it directly on the skin and it relieves the itchiness and swelling. 4. Madre de Cacao – during the height of the fly invasion, Franco and I experimented with madre de cacao leaves. I mopped half of the floor with some madre de cacao “soup”. The flies stayed away from the side I mopped! Then, 15 minutes later they came back. A tantalizing, but short-lived success. We are considering other ways of preparing the madre de cacao. 5. Soapy water in a spray bottle – It works! You can kill a fly with soapy water! The problem is getting the soapy water on the fly. Spray bottles are not that accurate. I don’t plan to continue using soapy water on the flies because I miss too often, it uses up too much soap, and the ants don’t pick up the dead flies. We have so many ants in the area that I’ve gotten used to seeing them rush in as soon as something edible falls to the ground. It seems wrong not to see them carrying out the dead flies. 6. Pine Sol Cleaner – This commercial product contains some pine oil and a whole lot of chemicals. I decided to try it out as well. The pine scent is supposed to repel flies. I tried the recipe used by some people as a horse spray: tthree equal parts Pine Sol, apple cider vinegar, and water. The apple cider vinegar is also supposed to repel flies. I tried it on the furniture. It didn’t work. I might try it without the vinegar next time. 7. Electric Fly Zapper – Some people don’t like them because the zapping part could spread fly parts into the air and surroundings. The flies are attracted by the UV light, so it doesn’t work well outdoors. I am glad that the flies have lessened, even if I don’t know why. Now they’re just pesky, not a pestilence! Thanks Mother Nature, insects, birds, or whatever forces killed off all those flies. 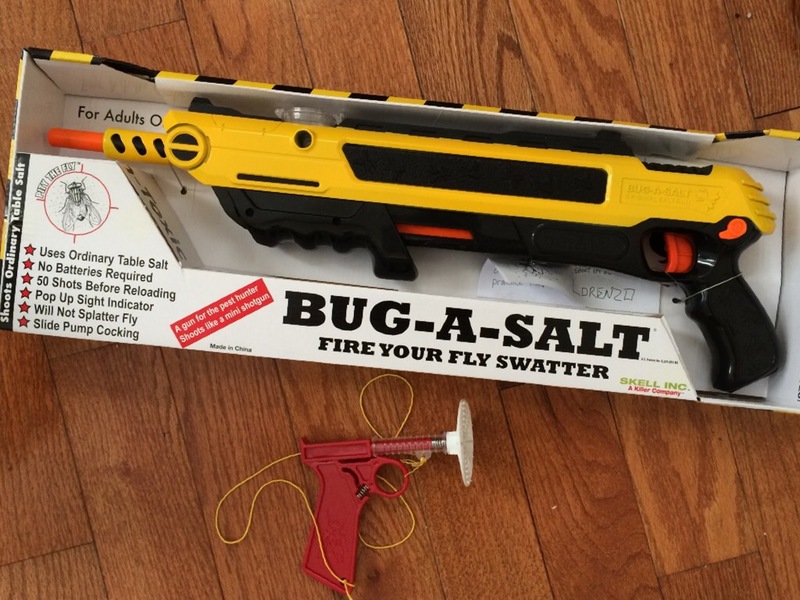 In the meantime I will just keep the cottage clean and tidy, encourage more fly-eating creatures to come around, and wait for the arrival of the Bug-a-Salt fly killing gun and Original Flyshooter that I ordered when I was panicking over the flies! Previous Previous post: Thanks for the Riding Arena! Next Next post: Good Morning, Birds!